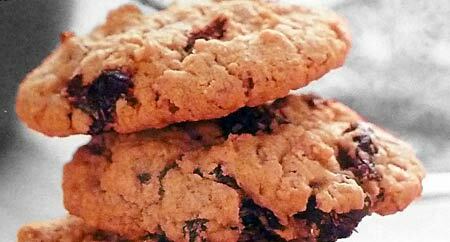 This easy cookie recipe offers a fun and flavorful twist on traditional oatmeal chocolate chip cookies. The results are pure decadence thanks to the additions of dried cherries and grated orange peel. You'll get the heart-warming cinnamon taste you're familiar with in most popular oatmeal cookies, along with a little tart from the cherries, a little citrus from the orange and of course chocolate, without which these special treats would be incomplete! Cherries are not only tasty, but they pack a nutritious punch too. Research suggests tart cherries may offer anti-inflammatory benefits, act as a general pain reliever, and help with overall heart health. We've also enjoyed this recipe when substituting goji berries for the cherries. In a small bowl, soak the dried cherries in hot water for at least 10 minutes. In a large mixing bowl with an electric mixer on medium speed, cream the shortening, butter, brown and white sugars until light and fluffy. Beat in the eggs, orange peel and vanilla extract. In a medium bowl, stir together the oats, flour, baking soda, cinnamon and salt. Gradually add the dry oat mixture to the creamed mixture and continue mixing until thoroughly combined. Stir in the cherries with the liquid and the chocolate chips until distributed throughout. Drop dough by heaping tablespoonfuls at least 2 inches apart onto prepared baking sheets. Bake for 12 to 14 minutes or until edges are lightly browned. Allow cookies to cool on sheets for 1 minute before transferring to wire racks to cool completely.